Ignite is back! Join us at the O'Reilly Velocity + Fluent Conferences in San Jose. "Enlighten us, but make it quick." The night includes time to network and chat, so be ready to mingle. Ignite will be hosted at the San Jose Convention Center by Velocity Conference and Fluent Conference—it's free and open to the public. 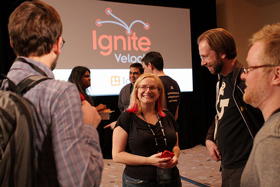 Velocity and Fluent attendees do not need to pre-register for Ignite. Your conference badge allows your entry to this event. Those not attending Velocity and Fluent can pre-register for free on this page.